The Happy Handwriter’s Cursive Book 2 is the follow-on from Cursive Book 1. Together, these two cursive handwriting books can set your child on the path to success in cursive handwriting. It introduces capital letters by first establishing the upper case cursive form as the visual counterpart of the lower case cursive form. Once again, the memory game helps develop a strong link between the visual picture of the lower case and capital letters, which greatly improves the mastery and flow of cursive handwriting. Letters may be formed in both the large and small formats with multiple opportunity for repetition in the correct formation pattern. These cursive handwriting books then go on to focus on the critical areas of consolidation, flow, and speed of cursive handwriting. Well-consolidated cursive handwriting reduces the number of children who transition back to print a few years after learning to write in cursive. 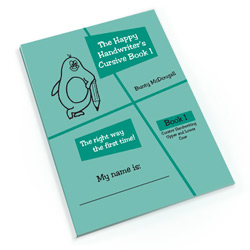 Once the capital letters have been mastered, the book moves on to developing the children’s ability to transcribe from printing into cursive, as well as working on developing the speed of their cursive, whilst maintaining the quality. Once again, use of The Happy Handwriter’s Books allows for consolidation of letters learned in class at home. The penguin that the children learned to love in Book 1 welcomes them back and shares their journey to a well-consolidated and flowing cursive script. With these sound foundations, children develop a well-consolidated cursive script, which is carried with them through the rest of their lives. 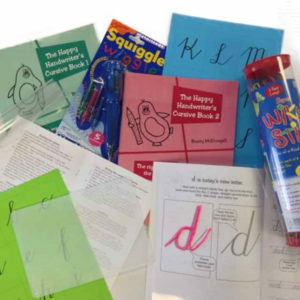 If you would like to follow a systematic multi-sensory approach to the acquisition of cursive, take a look at the Cursive Handwriting Bundle.